It’s hard to find a homogeneous IT stack nowadays. You may have a Linux server farm, but an AD cluster providing identity. Or you have a cross-platform build environment that builds your software for multiple different targets. Your management and automation tools need to be able to handle multiple, vastly different targets - Linux, Unix, networking, cloud services… and Windows. ANSIBLE: LINUX LIKE LINUX, WINDOWS LIKE WINDOWS. 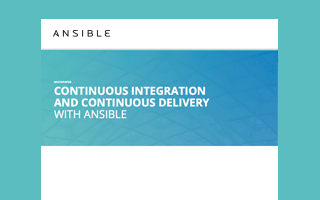 Users and customers love Ansible’s simple, agentless, powerful automation that allows them to model and deliver any configuration, any deployment, any environment across their IT infrastructure. Ansible knew that the key was to bring the same simple, agentless paradigm to managing Windows, while still feeling native to Windows administrators. Ansible’s native Windows support uses Windows PowerShell remoting to manage Windows like Windows in the same Ansible agentless way that Ansible manages Linux like Linux. You can connect to and automate Windows using local or domain users, and soon you’ll be able to use Windows ‘runas’ support to execute actions as the Administrator, just as you would use ‘sudo’ or ‘su’ on Linux. Plus, with Ansible’s easy extensibility, you can write your own modules in PowerShell and extend Ansible for whatever other functionality you need. Ansible users have written modules for managing filesystem ACLs, managing Windows Firewall, and managing hostname and domain membership, and more. And when you need to roll this out across your team, Red Hat® Ansible® Tower works out of the box with Ansible’s Windows support. For more information on Ansible’s Windows support, check out our Intro to Windows, and our List of Windows Modules. Download Rolling Updates & Continuous Deployment with Zero Downtime now!